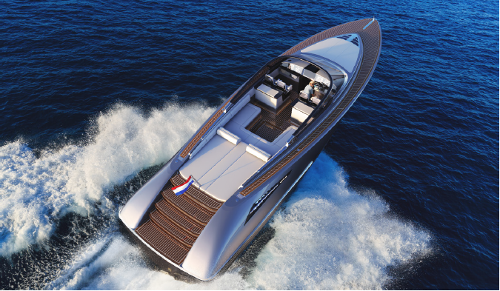 Blending almost 25 years of experience with the very latest insights into performance and comfort, the Wajer 55 is the largest powerboat built to date by the renowned Dutch yard Wajer Yachts. This elegant and sophisticated 16-metre beauty builds on the achievements of its award-winning predecessors while adding a range of smart innovations of a type more commonly seen on superyachts. The fact that 12 vessels were ordered before the first Wajer 55 is even launched speaks volumes for the success of this new flagship. Using innovative lightweight materials and state-of-the-art production methods, our craftsmen have ensured that the Wajer 55 sets a new benchmark in its class. The flagship also leverages on Wajer’s many years of experience at sea and the yard’s ongoing search for perfection. Take, for example, the swimming platform which can also be used as a swimming ladder or gangway, or the ingenious automatic foldable roof. 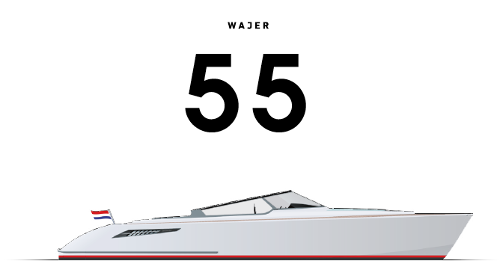 The Wajer 55 will be introduced this summer. • Pushbutton fender system, inflating automatically and operated remotely. • Swim platform doubles as a gangway. • Hydraulically operated anchor operated from the steering console. • Adjustable console and movable cockpit floor. • Three powerful 435 hp IPS600 Volvo Penta engines. • Williams Turbo Jet tender in the aft. • Wrap around glass windshield, four metres wide. An example of this approach in practice is the pushbutton fender system, with fenders popping out from the side and inflating automatically. This adjustable solution can be operated remotely as well as from the main steering station screen. Wajer Yachts is the first yachtbuilder to implement such a system on a yacht below 17 metres and currently has a patent pending. Another neat innovation is the way the hydraulically operated anchor concealed in the bow can be conveniently operated from the steering console. This automated operation is aided by a camera, dispensing with the need to brave the elements when dropping/raising the anchor. 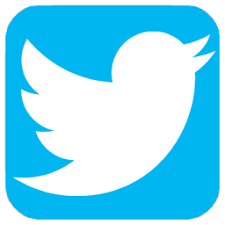 The innovations continue elsewhere. The fully automated bimini/sprayhood retracts into the aft seating area and the table in the cockpit lowers into the floor via a hydraulic mechanism, freeing up space. The swim platform, developed and produced in the Netherlands especially for the Wajer 55, is exceptionally large and doubles as a gangway. At 1.8 metres, this smart passerelle is wide enough for several people and adjusts to the height of the quay. In terms of its construction, the Wajer 55 is designed for maximum comfort in the water and excellent manoeuvrability. Weight savings were a key aspect during the design phase and the lightweight construction was achieved using lightweight materials and next-generation vacuum technologies. Low noise levels were a further priority. And yet, despite her quiet air of luxury, this is also very much a performance machine. The Wajer 55 is one of the very few yachts to feature three powerful 435 hp IPS600 Volvo Penta engines. Her high-tech V-design hull, excellent balance and effective spray rails make for a smooth and dry ride. The engines, which can be operated via joystick drive, are compact enough to leave sufficient space in the aft section of the boat for a 2.85-metre Williams Turbo Jet tender. Despite the low profile of the 16-metre Wajer 55, the tender is concealed entirely within the aft section, below the sun pad. 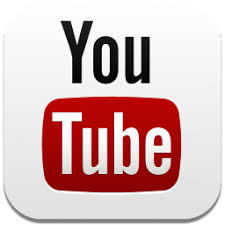 It is released via a hydraulic system, making it very easy to launch and retrieve. This provides an unbeatable way to visit secluded coves while out on an extended trip, one which will be further enhanced by the long-range fuel tanks, spacious galley and overnight accommodation for between four and six people. The Wajer 55’s state-of-the-art cockpit features a Raymarine glass bridge system with four touchscreens at the helm, all part of a highly intuitive system that is easy to operate. Four captain’s chairs with custom-made suspension maximise the options for guests to join the fun of sailing. 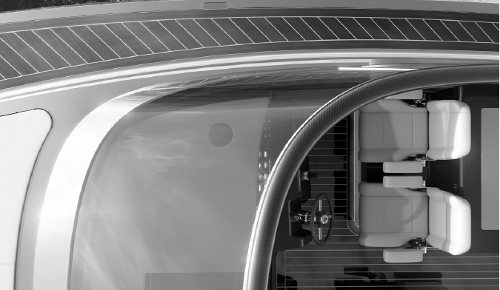 Similarly, the console can be brought forward, and the moveable cockpit floor can be raised for better views or lowered to enhance protection against the elements behind the windshield. This huge wraparound windshield, a typical Wajer element, is almost four metres wide and made of tinted glass. 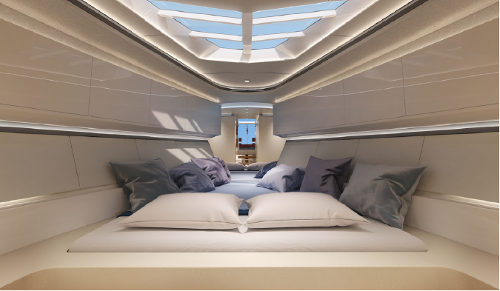 Other major highlights include the skylight above the cabin in the forward part of the boat. A discreet yet fascinating signature attribute is the fan-shaped pattern in the composite deck referring to the Dutch meaning of the company’s name. With a standard price of 1,695 million euros (ex VAT), all these attributes are offered at an impressive price-quality ratio. 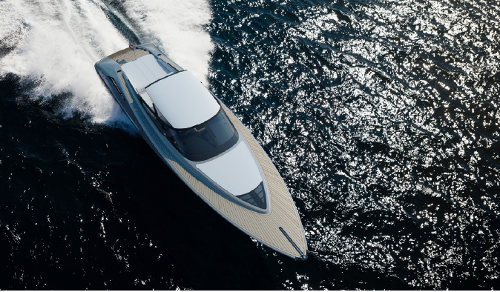 Built to order with a wide range of customisation options, the first Wajer 55 will be unveiled at the Monaco Yacht Show. 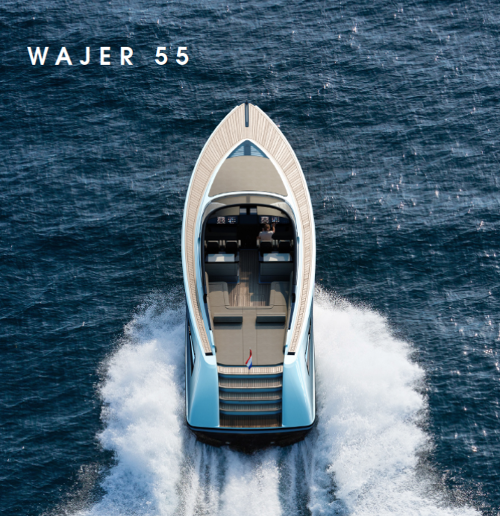 The Wajer 55 also benefits from the expertise of two leading lights of the Dutch superyacht industry. The overall design was created in partnership with Sinot Exclusive Yacht Design while Vripack was responsible for the naval architecture and the hull. As a family-owned and run business, Wajer Yachts is known for its customer focus. Dorus Wajer, who founded the company in 1992, and his son Dries, who joined it in 2010, have a close affinity with watersports and are driven by perfectionism. The brand has become synonymous with fine Dutch design, a premium sailing experience and unrivalled service and support. All Wajer boats are made at the yard in Heeg, the Netherlands using a combination of precision technology and traditional skills. For the first decade and a half of its existence, Wajer was mainly known for its striking Captain’s Launch. The introduction of the Wajer 37 in 2006 was a major milestone, especially after it won the Boat of the Year award in the Netherlands. Seven years later, the Wajer 38 emulated its predecessor’s successes and introduced further popular features, keeping Wajer Yachts firmly in the forefront of yachtbuilding excellence. Launched in 2016, the Wajer 55 continues the tradition of blazing new trails with a yacht that is designed entirely with the comfort of owners in mind.